2008, Dir. by Glenn McQuaid. After a couple of years on the festival circuit and a limited theatrical run, writer/director Glenn McQuaid's Victorian horror comedy I Sell the Dead has finally hit shelves this week. After an intriguing trailer (scroll down for that one) and the promise of Larry Fessenden's Glass Eye Pix and Scareflix companies being involved in it, I knew this was the type of new horror I could not miss. 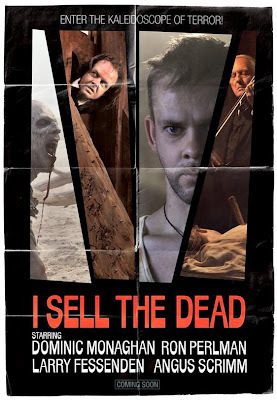 I Sell the Dead begins by introducing us to Arthur Blake and Willie Grimes (Dominic Monaghan of Lost/Lord of the Rings and Fessenden, respectively) who're about to be beheaded for the crimes of grave robbing and murder. As a priest (RON FREAKING PERLMAN!) 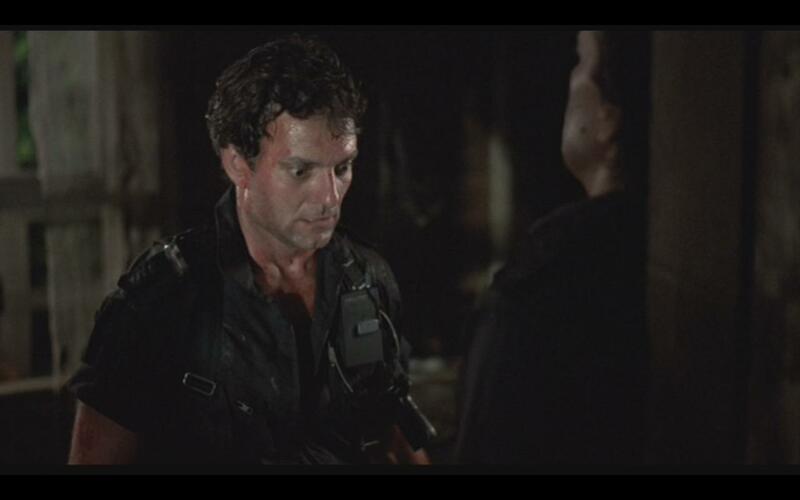 attempts to get Blake's last words, Arthur insists he's not responsible for any murder. He is, however, more than willing to recount his history as a grave robber - and those flashbacks are where the meat and potatoes of this film lies. Through Arthur's flashbacks, the film is allowed to tell tales of various horrors. It starts simple with grave robbing, but with time things get weirder. Without spoiling any details, I can let you know that you should expect I Sell the Dead to offer many different types of horror and sci-fi characters throughout. Many of the monsters at foot will be evident from the start of each encounter, but the fun of the film lies in how McQuaid handles these oddly macabre situations. 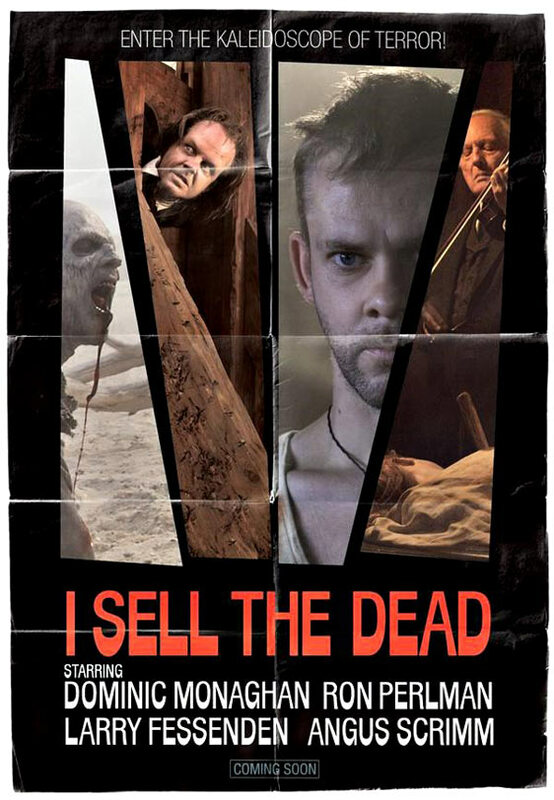 Visually, I Sell the Dead is a treat, despite being very low budget. The influence of Hammer Films is evident (during the special features the cinematographer speaks of being influenced by Freddie Francis' overlooked Paranoiac!) in the framing of cemetery scenes, with fog blowing across the screen constantly and blue-tinted night skies for effect at times. Costumes also fit the Hammer bill, as does most of the excellent musical score. But this is most definitely not the only influence on McQuaid's film, which is full of dark comedic moments. Fessenden is the key to this tone with his performance as Willie, a vile character who could be the "Old English" answer to the redneck. Monaghan plays the straight role most of the time opposite Fessenden's haggard mannerisms, and the banter between the duo provides many strong laughs. 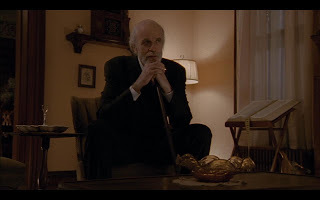 Aside from Perlman's relatively small serious role, the film also features a supporting performance from Phantasm's Angus Scrimm, who makes the most out of a brief mad scientist role, and Scareflix veteran John Speredakos as a villainous rival dead-seller. Trouble comes when I Sell the Dead tries to balance its comedic and atmospheric moments, and this leads to a slightly disjointed feeling through the first hour of the film. The final reels seem to even out and lead to an enjoyable climax that's filled with some darkly humorous moments of blood splatter. The film ends rather abruptly though, which surprised and disappointed me. The copy of the film I picked up came with a free comic book version of the story, and it seems to me like that medium might fit I Sell the Dead's intentions better than the film did. I found myself genuinely interested in the exploits of Arthur and Willie, and the film showed the ability to add and subtract rich supporting characters as needed. The film definitely could benefit from more actual time being devoted to its characters - at 85 minutes the film barely manages to introduce the characters and the situations they deal with before the end credits roll. 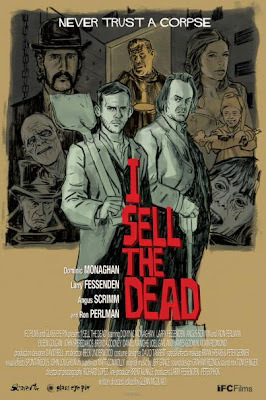 I enjoyed being introduced into the supernatural world I Sell the Dead has created, and I'm sure it's a film I'll want to rewatch a few times based solely on its originality - but I definitely was left wanting more. I hope we'll see more of Arthur and Willie again down the road, whether it's through the rumored sequel or comics (or an animated movie would also fit this world well), because there's a lot of greatness in the ideas McQuaid and company present in I Sell the Dead. In fact, there's enough good moments that I definitely recommend that any fan of independent horror give this one a chance - it might not win you over entirely, but I can't imagine you won't find some joy in its madness. And, for good measure, here's a cool retro poster and the trailer. Enjoy! When I started this blog back in the day, I had a desire to focus on a lot of really ridiculous movies, and I've noticed lately I've lost that a bit. I know what you're saying: "The Mike, your last recommendation was a killer scarecrow film, what do you mean not ridiculous?" You have a good point. But I'm talkin' bout that supremely enjoyable type of cheese that you know isn't a "good" flick that you know you can't take your eyes off. 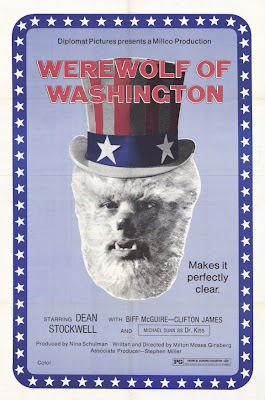 I'm talking about movies like Werewolf of Washington, the first film I'll feature in my new Supremely Cheesy Cinema series. 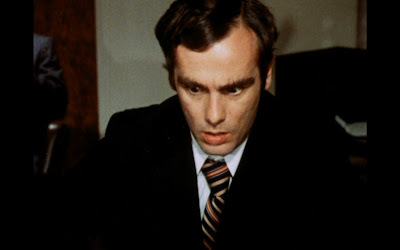 A pseudo-remake of Universal's original The Wolfman, Werewolf of Washington focuses on a presidential adviser named Jack played by Dean Stockwell, most famous to my generation as Scott Bakula's time-jumping adviser on Quantum Leap. Jack is young and successful, to the point of dating the President's daughter behind his back and, while trying to avoid said president, getting offered a spot he "couldn't refuse" as a press aide that apparently is the closest possible position to the President available. But before he can fulfill his duties in said position, he has to take a trip to Hungary and get attacked by a wolf who turns into a man after he kills it. Like Universal's tale, there are thankfully gypsies on hand to sort out all the lycanthropic details for Jack. Back in Washington the next day (No rest for the wolf-ed, am I right? ), Jack feels a little dogged while attending a shindig at the White House. After awkwardly avoiding the First Daughter's advances in front of the Pres (played by Biff McGuire, hence I will from here on out refer to him as 'President Biff'), Jack is left in the care of a rich madam who's had a few drinks. She smartly heads off on her own, only to be mutilated outside a grocery store. By this point any moderately trained horror viewer knows what's going on with Jack, and he does too. He's seen the pentagrams on his victims' hands and bears a non-scary star on his chest. Of course, no one else will believe him, which leads to a) some extremely cheddar overacting and b) some ridiculous comedic moments, like the time he has to hide out in a bathroom stall to avoid President Biff and an astronaut or the time he goes bowling with President Biff and gets his wolfy fingers stuck in the bowling ball. (Slightly scary - Who hasn't had fears of getting their fingers stuck in a bowling ball?) Amidst the goofy interludes, Jack continues to turn into a he-wolf nightly and go out for a lone murder. Two questions arose in my mind at this point: 1) What happens to the werewolf after he's made his kill? Does his animal instinct tell him he's done and that it's time to go pee on fire hydrants before passing out? Does he drink pina coladas like Warren Zevon said? ; and 2) How does Washington D.C. get 5-6 consecutive nights of full moon? That's totally not fair! Werewolf of Washington has some surprisingly good moments, particularly in Stockwell's performance. When he's not being asked to do entirely ridiculous things he nails the paranoid tragic figure we've come to expect from werewolf flicks, and handles a lot of the physical aspects in an effective manner when other actors may have become too embarrassed by the goofiness to completely sell out in the name of the role. 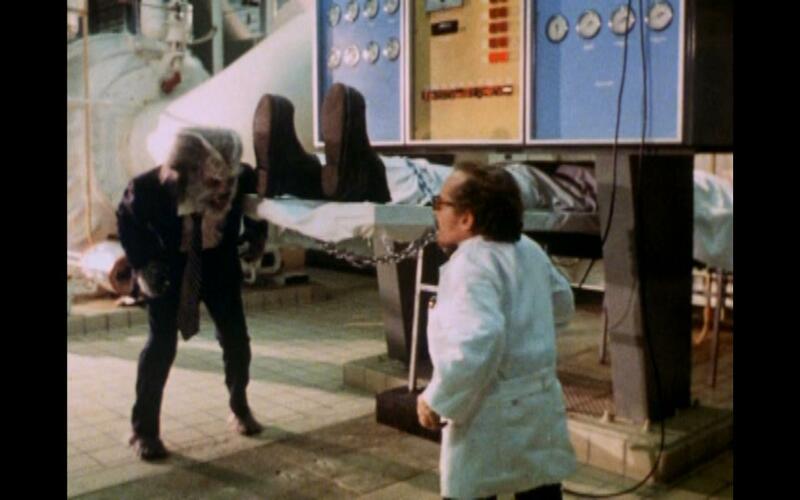 The werewolf makeup and transformation scenes are done with surprising competence, too, until the point when the director must have said: "OK, now you've got the makeup...just...uh...well....crawl around the shag carpeting and knock things over for a bit!" And, just when things couldn't possibly get sillier, there's a secret lab led by the diminutive Dr. Kiss that exists under the White House. Dr. Kiss' encounter with Were-Jack must be seen to be believed, but let's just say that it made TV hostess Elvira scream: "Hey Jack, stop licking that midget!" And is that a Frankensteiny monster that Jack's been sniffing? No one really knows, because the film just decided to let this subplot die. Werewolf of Washington is one of those rare b-horrors that features enough moments of strength that you want to actually call it a good movie...until it does something silly and completely loses any shred of credibility it had. And when it does carom off the rails, what follows is usually so random that you can't help but laugh at the results. 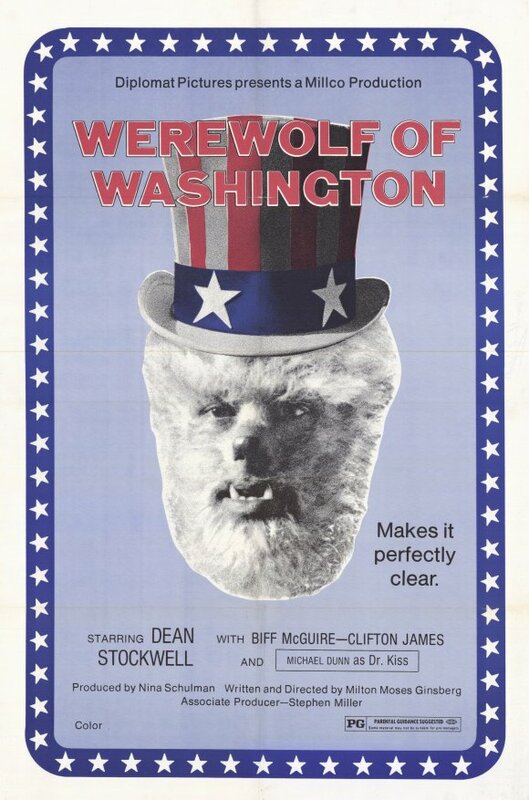 All these forces come together like a magical conjunction to make Werewolf of Washington more than deserving of the Supremely Cheesy Cinema label. P.S. - I caught this flick on DVD as an episode of Elivra's Movie Macabre, hosted by the unforgettable Elvira and her ample bosom. Good memories deserve a picture. Happy viewings! Aside from that Oz-based Wizard flick, cinema has pretty much always painted the scarecrow in a negative light. I guess I can understand to an extent, coming across one in a field during the dark of night would be a bit ominous, but it's always seemed like one of the more irrational frighteners in horror lore to me. And yet, I think that's what makes me want to see those movies whenever one pops up, even if it's something I know will be balls-to-the-wall terrible like Scarecrow Gone Wild. 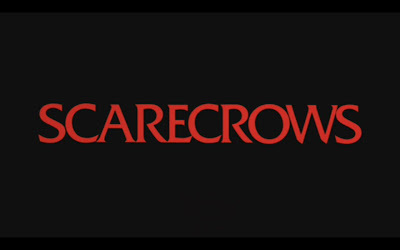 Leaving movies that star former UFC and WWF star Ken Shamrock out of the equation, and aside from the long lost and much The Mike-anticipated Dark Night of the Scarecrow, the most successful straw-filled killer flick I can recall is 1988's Scarecrows. Scarecrows opens with a team of military rogues in a small plane, fresh off of the successful theft of 3.5 million dollars from an apparently rich military base. Not wanting to waste time, the film quickly shows us that one of the soldiers of fortune decides he wants all the money, and does the best thing he could think of...jumps out the plane with the cash, landing in the middle of a field near a house that has far more scarecrows than would ever be humanly necessary. All this happens in the dark of night, and the runaway jumper soon begins to hear a little voice in the fields warning him about his choice. He does what most mentally unstable military-gone-psycho types would - freaks out, shoots his gun all over the place, and then is shanked by a creepy undead scarecrow. (See the video below for proof.) Money makes the world go round, so of course the rest of the team wants their defector's head and their share of the booty. This leads them to insist that the father/daughter team of pilots they've kidnapped take the plane down in this secluded area with a conveniently deserted house, and the evil force tracking trapped people with guns game is set. I know I'm giving Scarecrows a bit of a hard time, because it is an incredibly ridiculous film full of bad acting, silly plot advancements, and one-dimensional characters that seem to have been found on the cutting room floor of Aliens or Predator. It's full of rich dialogue like "I think this place is possessed by demonic demons." or "All this time you were just jacking us off with sand paper! ", too. 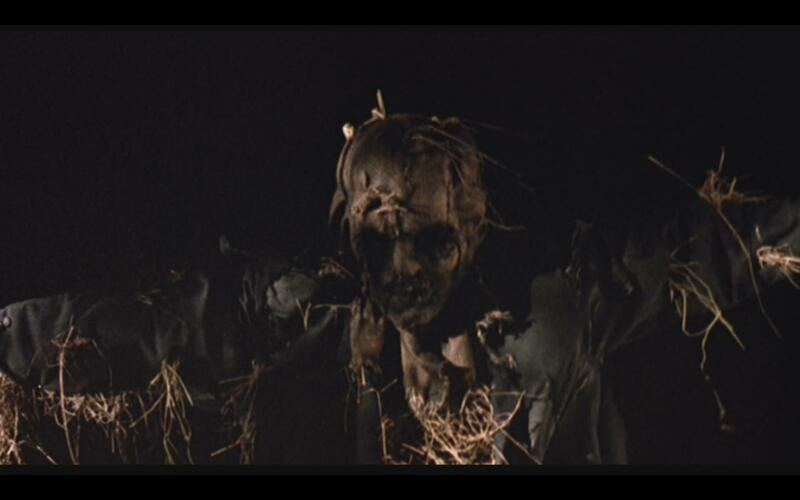 But aside from the ridiculousness of it all, there's an underlying charm in Scarecrows' efforts. For starters, the film is dripping with a menacing visual style. The entirety of the film takes place during one jet black night, and there's always a feeling of impending doom in the air. While many horrors of the era were struggling with lighting darker scenes and avoiding a murky look, the camera here offers a crisp image with few imperfections. I'm not sure how much of this is due to the MGM DVD transfer that I watched, but the film visually doesn't seemed to have aged a day in 22 years. The sound design is also wonderful, with an effective musical score and great balance between the characters' words and the sounds that surround them. The opening scenes in which the angry planegoers constantly talk trash to their teammate that eloped with the cash can be a little excruciating thanks to the dialogue, but the way their radio communications are heard really impressed me. Though the acting is generally one note and dull from the relatively no-name cast, there was one performance that I thought really helped the film. Michael David Simms' turn as Curry, the loudmouth who tries to be a leader and ends up going a little crazy, is very effective as the final reels roll, leading to some creepy moments where he hams it up wonderfully. The character also offers up some of the few thought-provoking issues in the minimal plot, debating what kind of fate sent the group to this horrible place late in the film. Though the film doesn't do much to expand on the ideas at work, Curry at least reminds us that there is some thought going into the film. While Scarecrows is a frustratingly mediocre move in plot, it has an '80s charm that wins me over every time. Mixed with impressive visuals that create tension instantly, we're left with a mindless-but-good-looking horror flick that goes down easy. Until someone figures out what exactly it is about scarecrows that breeds creepy and turns it into a bit of awesome (or until that Dark Night of the Scarecrow DVD finally arrives), Scarecrows will do plenty fine for me. 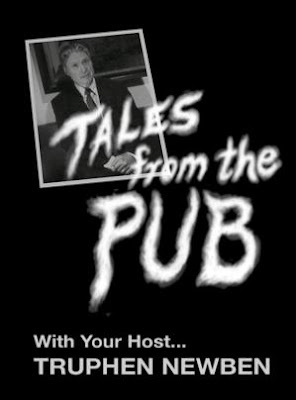 Recently, whilst inducting FMWL's first Hall of Fame class, I talked favorable about a fellow called Larry Blamire, and mentioned his webseries of short spoofs, Tales From the Pub. With episodes running around 2-3 minutes in length, the series offers several short tales of ridiculous terror that remind one of chiller TV shows like The Twilight Zone. Since I like Blamire's work and like The Twilight Zone, I figured this would be a fine topic to cover here...by posting a few of the videos from the series. The first example I'll offer is entitled 'The Death Napkin'. It stars Andrew Parks, who also serves as the series' awesomely-named narrator Truphen Newben, and tells of a...well...a death napkin. 2009, Dir. by Gregg Holtgrewe. After reading a few reviews from other fellows and checking out the official website and trailer, I had a gut feeling that Dawning was a movie worth seeking out. Previously I've avoided screener situations, but the word on Gregg Holtgrewe's film had me willing to take a chance. I'm very glad I did. 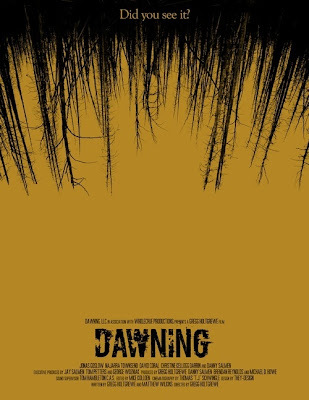 Dawning opens with two siblings heading to a secluded cabin where their father and step-mother reside. What's planned as a weekend of family bonding for the group quickly turns into an experiment in fear. While the setting brings to mind films like The Evil Dead or Cabin Fever, the experience Dawning offers is quite different than anything you've seen in their brand of horror film. Dawning draws its power from the script, which focuses on establishing this seemingly normal family and the differences that divide them. The father may or may not be working to recover from alcohol dependency, while his son is focused on sneaking off for a calming joint and is considering dropping out of college against his father's wishes. At the same time, both children aren't yet sure if they accept their step-mother or their differing paths in life, and there's an uneasy dynamic between everyone from the start. I'm reminded of The Omen when considering the force at work in this film - particularly the warning given that discusses evil "pitting man against his brother, til man exists no more." By quickly establishing the discord between family members, the setting alone provides tension for the viewer when considering the relationships of the characters in peril. When a beaten and terrified man shows up at the cabin claiming that "it" is out there, we don't need to know much more. We've already seen that this family can't agree on how to deal with difficult situations together, and that's as dangerous to them as whatever "it" is. Dawning not only establishes an engaging sense of dread through its plot, it's technically sound to boot. 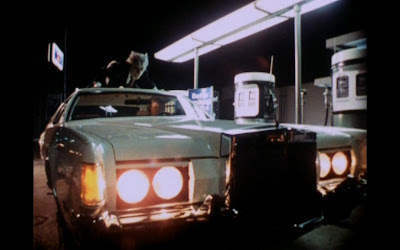 The film is shot crisply, using the confined setting to its advantage while creating distance between characters and objects with some great foreground/background shots. The sound design is most impressive, turning creaking boards and rustling trees into the bumps in the night you'd expect from a film of this sort. This isn't a film without flaws. Some of the acting is a little forced, but considering the deep material and the relative inexperience of the cast they're better than I expected. The performances are very real, and that's what's most important to a visceral film like this. It's also a slow burn of a horror film, comparable to last year's The House of the Devil in pace, and by the mid-point of the film I found myself wondering how the film could wrap everything up within its runtime. This does leave the ending seeming very abrupt, but it also left me with questions to ponder as the end credits rolled. I don't know if Dawning will find its way out of the woods and make its mark in the landscape of horror cinema, but I'm definitely pulling for Holtgrewe and his film. Dawning kept me entertained, intrigued, and even a little bit afraid for 80 minutes, leaving an impression that has me wondering about it days later. I commend all involved for putting together a completely effective horror/drama that avoids most of the traps modern horrors slip into, and thank Mr. Holtgrewe for the chance to experience such an intelligent horror film. 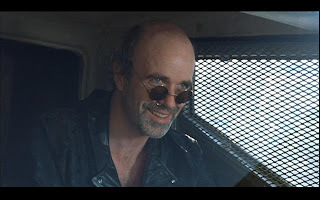 If we were playing a game called "Things that are AWESOME", one of the things I'd probably mention is 6'6" actor Tom Noonan, one of my favorite character actors of the last few decades. And, since he's awesome, I figured I better do a Midnight Top Five listing some of my favorite performances from his career's jumps into the kind of films I love. 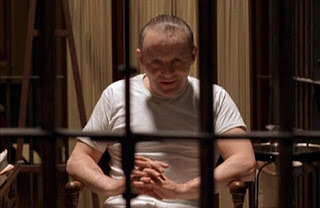 Francis Dolarhyde/The Tooth Fairy in Manhunter - When the topic of Noonan arises, this is generally the place to start. 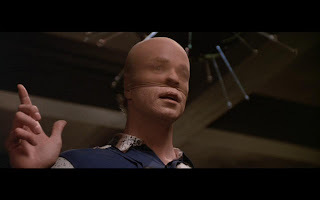 I don't care that it's the first Hannibal Lecter film (Brian Cox is great, but that's a story for another day), the terrifying part of Manhunter is Noonan's turn as the vicious killer who makes Buffalo Bill seem normal. Even scarier are the moments of humanity that make him seem all the more likeable...despite the truth we already know. Cain in RoboCop 2 - RoboCop 2 isn't anywhere near as impressive as its predecessor, but it's a far cry better than the third installment and the Sci-Fi Channel movies that followed. This is, of course, thanks to Noonan's turn as another psycho. This time he's Cain, the kingpin drug dealer who shows no mercy, especially once his beaten body becomes a new breed of RoboCop gone awry. Plus you get the added bonus of digital Noonan while in robo-form. That's a winner. 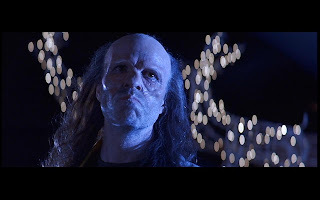 The Ripper/Tom Noonan in Last Action Hero - There were several films that I absorbed repeatedly on HBO as a youngster, but this one has been one of the few that has stuck with me strong. A large part of that is my unhealthy obsession with all cinematic things Schwarzenegger, but it also remains a joy thanks to the spot-on look at action cinema of the era. Noonan's portrayal of the Ripper, as stereotypical a disfigured villain as can be conceived, is richly sinister while sticking with the cheese factor of the film. 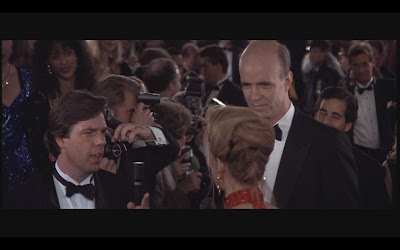 And, we get a bonus cameo from Noonan...as Tom Noonan....late in the film. Sheriff Decker in Knockaround Guys - Knockaround Guys is a middle-of-the-road action/comedy that's designed to be about a lot of young stars (Barry Pepper, Vin Diesel, Seth Green) playing off of established stars (John Malkovich, Dennis Hopper). But Noonan's supporting role as the small-town sheriff who gives up a passive role in the name of greed is easily the most interesting part of the film. Thanks to him, the film goes from average to enjoyable in a few simple scenes. 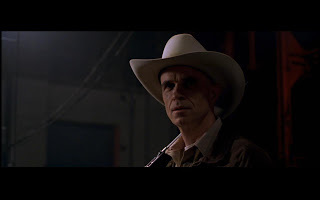 Mr. Ulmer in The House of the Devil - I really wanted to fit a more heroic role into this list, but Mr. Noonan left me no choice but to include his subdued performance in last year's horror winner The House of the Devil. As the quiet man who sets the film's events in motion, Noonan's mannerisms and stuttering attempts to alleviate the lead's fears provide a spark to the uneasy feeling that fills the rest of Ti West's film. That's five, but I assure that there's much more Noonan out there for you all to experience, like recent Midnight Movie of the Week The Roost and the '80s classic The Monster Squad. Have your own Noonan faves? Hit up the comments below! FMWL's First Hall of Fame Induction Ceremony! With this typing, From Midnight, With Love is now into its 100th post. As a celebration of this meaningless centennial entry, I'd like to take time to induct the very first entrants in From Midnight, With Love's just-now-founded Hall of Fame. The following inductees are recognized in their respective branches for significant contributions to the love The Mike has for Midnight & Cult cinema, and will be presented with...well, not really anything except my undying love and respect. The first inductee into FMWL's Hall of Fame is none less than the man (kinda) silhouetted in the logo above - Alfred Hitchcock. 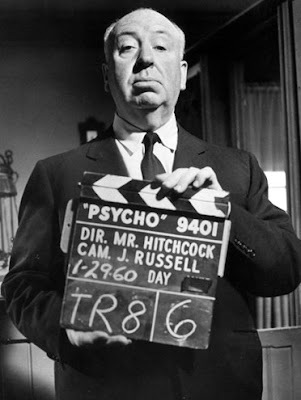 Though it's difficult to call Mr. Hitchcock's films Cult fare, considering he's one of the most commercially successful and popular directors of all-time, to me it's a given that he belongs. Through works like Psycho, Rear Window, Vertigo, and The Birds he brought the macabre and terrifying to the masses like no one else has since. On a personal level, I can't think of a filmmaker who's had a bigger impact on me in regard to my hunt for treasures of the past. 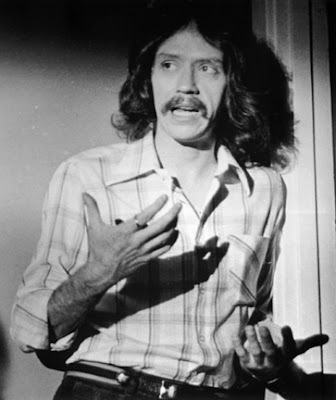 After Hitchcock, there was John Carpenter. His rogue tactics that led to a string of films from Assault on Precinct 13 in 1976 to They Live (to which I've paid tribute in the FMWL HOF Official Seal) in 1988 that each rank as a sci-fi or horror classic in my book. 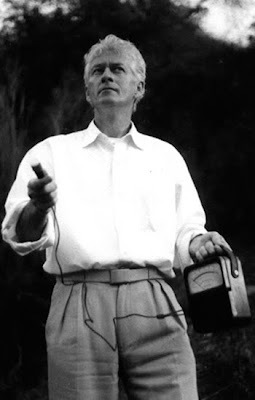 He invented the modern slasher film with Halloween, my favorite horror movie, and was the first "genre" filmmaker I really began to seek out. 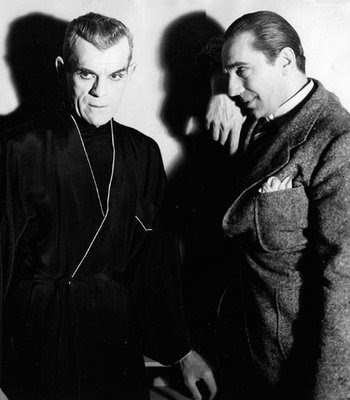 The Actor's Branch Though each deserve their own accolades, it's impossible to not mention Bela Lugosi and Boris Karloff in the same breath. In their own ways, each man established the horror genre for what it would become in Universal's golden age of terror, and each left a lasting impression that's still relevant nearly 80 years after their most famous films hit screens. Karloff's imposing presence and Lugosi's menacing stare will never go out of style, and both men are worthy of being the first actor inducted in our Hall of Fame. 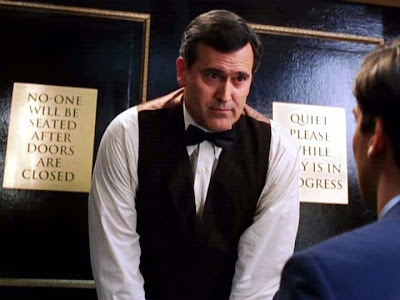 Bruce Campbell has definitely lent his talents to a few stinkers since the Evil Dead trilogy catapulted him to hero status, but when I think of cult icons of the past 30 years his face is always the first thing I see. From those three films to his tour-de-force performance in Bubba Ho-Tep and his consistently awesome TV roles (The Adventures of Brisco County, Jr., you guys!) and countless other fun performances, Campbell is exactly the kind of actor From Midnight, With Love is designed to feature. 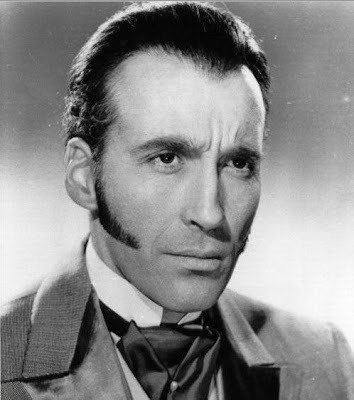 While Lugosi gave Dracula his first iconic portrayal on-screen, Christopher Lee took the classic character over with style while working with Hammer Films. Lee has additionally starred in dozens of fascinating horrors, anchored by Robin Hardy's fantastic The Wicker Man and Hammer's The Devil Rides Out, and has maintained an active role in the horror genre when many actors would have retired. 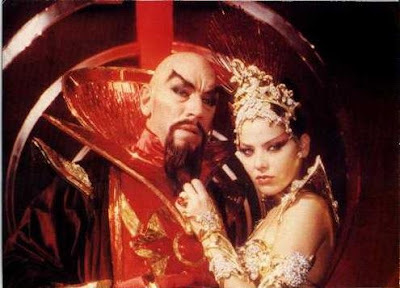 If there's an actor with a career that's been as interesting to me as Lee's, it's Max von Sydow. He's played no less than Jesus, Death, The Exorcist, and Ming the Merciless (my personal favorite role of his, because it allows me to exclaim "KLYTUS, I'M BORED!" like him), plus he's co-starred in countless sci-fi/horror/thriller flicks as he ages. Like Lee, he's been versatile and involved for over sixty years. When the term "scream queen" comes to mind, not enough people mention the classic Hollywood example of the term - Fay Wray. In films like Mystery of the Wax Museum, Doctor X (pictured above), and The Most Dangerous Game, Wray paved the way for women in horror for decades to come. And of course, her most famous film, King Kong, is pretty darn worthwhile too. The Modern-Day Branch Larry Blamire is a filmmaker that most don't know about yet, but after The Lost Skeleton of Cadavra and the goings on over at BantamStreet.com, I'm convinced that a large portion of my future midnight movie loves will come from the works of Blamire and company. With The Lost Skeleton Returns Again, Trail of the Screaming Forehead, and Dark and Stormy Night finally hitting DVD this year, Blamire's loving spoofs of b-movie cliches will hopefully catch a bigger audience. Until then, I'll just keep watching episodes of Tales from the Pub. The 1980's Pop Star's Branch Because nothing inspires The Mike like a good '80s pop tune, The 1980's Pop Stars Branch of the FMWL needs to exist. Since she co-starred in the David Cronenberg mind-trip, we'll make Blondie's Debbie Harry the first inductee in this totally tubular branch. One way or another, she deserves it. The Monster's Branch If you've read The Mike before, you knew this was coming. The Blob is a must for the FMWL Hall of Fame's initial class. Because it's The Blob. 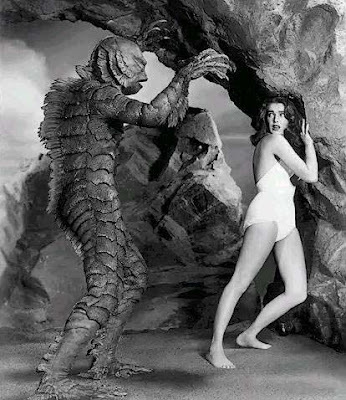 Though he may not fit in the same world as Universal's other classic monsters, I've always had a soft spot for The Creature from the Black Lagoon, one of the first horror monsters I ever saw on screen. Despite the slightly silly look of the Creature, I still get chills as he creeps up on the camera. And, he's very persistent when he sees a woman he wants - gotta respect that. The Joe Bob Briggs Branch of the FMWL Hall of Fame is dedicated to the people who've inspired me personally in my love of cult film and in maintaining this blog. 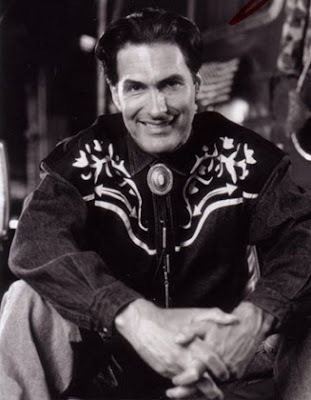 The first inductee here, of course, is.... Joe Bob Briggs. Starting with The Mike's viewings of TNT's still-missed MonsterVision program, and transferring into reading his reviews in print and online, Joe Bob Briggs embodies what the cult cinema fan loves about their genres. It's through Mr. Briggs' work that I began to realize there was a niche for gorehounds and fright fiends to find, and that there were lots of other people who shared my love of this stuff. The last, but not at all least, inductees into the FMWL Hall of Fame are The Mike's Family. There's my parents, on the left, who were responsible for letting me watch whatever scary movie I claimed I was ready to watch as I grew up. There's my sister, who helped persuade said parents that we were ready for the terrors of Clownhouse and Pumpkinhead and The Shining, and her husband who broke the ice when we first met by bringing a copy of the killer sheep epic Black Sheep. And then there's that last guy....I'm not sure who he is, but I hear he writes a mean blog. 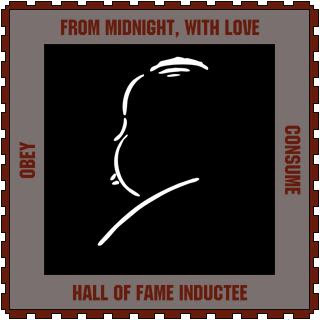 Congratulations and Thank You to the first class of inductees in From Midnight, With Love's Hall of Fame! And, for those who've read, thanks for helping to make From Midnight, With Love the rewarding experience it's been thus far. Let's keep rolling and look forward to an eventual second class of Hall of Fame inductees! If you were to know only one thing about The Mike and horror movies, that thing would be that Halloween is The Mike's favorite horror movie, and it's not even a competition. However, if you were to know two things about The Mike and horror movies, you'd know that one AND that The Mike is generally opposed to the slasher film existing as anything more than mindless entertainment. There are some rare exceptions that he either loves blindly (Happy Birthday to Me, April Fools Day, and Cheerleader Camp come to mind) or that he respects for shaking or mocking the genre's faults (Behind the Mask: The Rise of Leslie Vernon is the shining example here); but in general he finds that subgenre to be the horror film version of K-Mart. Meaning, you can get what you want there, but you've got to put up with a lesser quality and accept that you'll feel dirty afterward. The number one culprit of slasher mediocrity, in my eyes, has been the original Friday the 13th. Released less than two years after Halloween made the slasher formula popular (Two notes: a)By adding "popular" I negate the right of anyone to say 'BUT WHAT ABOOT BLACK CHRISTMAS, HOSER???? '; and b)While I say Halloween made the slasher formula popular, I would NOT call Halloween itself a slasher film...but that's a different story for a different day. 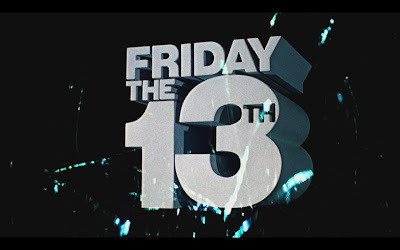 ), Friday the 13th never hid the fact it was a cash grab in the wake of Carpenter's film. But a recent post by Stacie over at Final Girl got me thinking a little more about the original film, even if I'd recently listed as one of my least favorite horror films (<------ Click there for shameless plug in which you can vote for The Mike!). 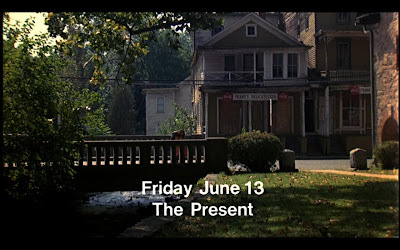 I thus set out to watch Friday the 13th for the upteenth time, this time really trying to figure out what it was others see that I must have been clearly missing. So, all that said (Yes, I realize I sounded like a senile codger) let's talk about the original Friday the 13th. For the first time in a few years, I sat down with it (now "UNCUT" and on Blu-Ray!) with an open mind for the first time in probably a decade. And, looking past my cinematic grudge, I firstly found the film to be more technically sound than I remembered. The slasher genre of the '80s is known for minimal artistic value, but it's definitely clear that the F13 series didn't start off in the gutter. The film is shot well by director Sean S. Cunningham, who has maintained an involvement in the series for nearly thirty years and clearly has care for the material he's presenting. It's a dark film, like Halloween or Black Christmas before it, but the photography by Barry Abrams really enhances what's going on inside the dark, adding atmosphere to the secluded camp setting. Plus there's Harry Manfredini's eerie score, and editing that jumps between scenes and settings briskly, keeping the viewer caught up with and interested in several happenings at once. Additionally, Friday the 13th does something Halloween didn't by offering up kills during broad daylight. The first kill (in present day, that is; also illustrated in the FG post I linked above) is one of the most dramatic and tense in the series, and Cunningham and Abrams frame it in daylight while using the wooded scenery to darken the scene. The film establishes that it will be unpredictable with this kill, and that dynamic carried through the rest of the series - for better or worse. Another thing that I've disliked about Friday the 13th in the past is that it lacks the iconic imagery of its killer that became the series' trademark throughout the mid '80s. However, looking at the original through fresh eyes reminded me how intriguing the mystery of our killer is in this film. Like the "Michael as Laurie's sister" storyline that was added in Halloween's sequel, it's hard to look back at the original without thinking of what came next. While I still find the reveal of the killer in this film slightly disappointing, mostly due to some hammy acting, it most definitely was an original idea at the time. I'm still not sold on the original Friday the 13th as much more than a popcorn slasher to watch while zoning out, and I'd rather pop in one of the Jason-filled sequels most days. But as a standalone film, without the weight of my baby Halloween on it and the expectations of its followers chasing it through my head, I have to admit that Friday the 13th is an efficient chiller that's a step above most slasher films on a cinematic level. And, as a peace-making measure, I think it's only fair that I give it a week to reign as Midnight Movie of the Week. Leprechaun 4, as you could guess by the title, is the fourth on screen appearance of that murderous, Irish, mini-monster; The Leprechaun. If all you know about The Leprechaun is Mike Myers’ "I’m the Leprechaun" spiel from Wayne’s World 2, then you haven’t really lived yet. In short, The Leprechaun is a Leprechaun who can’t die and kills people who try to take his gold, or in this case, his Princess. You may have also guessed from the title that this movie takes place "In Space." You may be asking yourself: "How does a Leprechaun get into space?" I don’t know, and neither does the film. It doesn’t matter. The genius behind Leprechaun 4 lies not in its attention to detail, but in its attention to murderous Leprechauns. It has one of those, and that’s all it needs. What follows is chaos. Lep kills. Lep rants. Dr. Mittenhand rants. Dr. Mittenhand becomes Mittenspider! The Princess reveals her breasts, signifying a death curse upon the crew. A robot cross-dresses. Like I said, chaos. 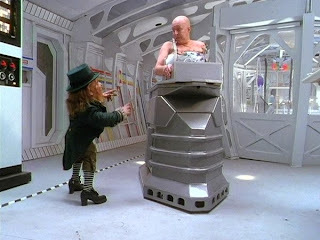 Is that not enough to make you love Leprechaun in Space? Well, then wait till you hear about the cast! Warwick Davis returns in the lead as Lep, and turns in a chilling performance that’s quite the opposite of his turns as Willow in Willow or Wicket in Return of the Jedi. He even quotes Shakespeare! Other than that we get the previously mentioned Miss Dunning, an actress who claims she was in "Catch Me If You Can", a beefcake/former soap opera star, and the guy who went on to star in the classic "Juwanna Mann!" Plus it’s directed by British director Brian Trenchard-Smith, who had previously directed (drum roll, please……………….) Leprechaun 3! Maybe killer Leprechauns that make silly jokes aren’t your thing. Maybe you like characters who have depth, and don’t have names like Mittenhand. Maybe you don’t see the brilliance in lines like "I am not defensive, and I will shoot anyone who says I am defensive!" If so, then I feel for you. You’re missing out on one of the finer things in life. 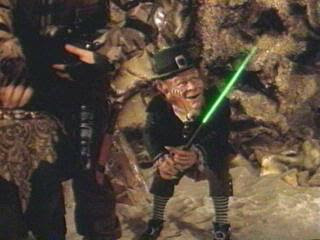 But to me, Leprechaun 4: In Space is an amazing example of just what movies can be. I watched it unflinching, thinking in every moment – "What is it these people are thinking? Why can’t I think like this? Where on Earth (or In Space) can I acquire such genius? How does the Leprechaun get into space? And where does he get such nice clothes, especially when In Space? And why did they have a Leprechaun sized spacesuit on board their ship? What kind of name is Mittenhand anyway?" I could spend many years of my life hunting for the answers to these questions. Unfortunately, I don’t think I’ll ever be able to reach such a heightened state of being. There's little debate that Jack The Ripper is one of the most notorious real world villains of all-time. The fact that we're still talking about him nearly 125 years later, or that people like Dreamcatcher Interactive (shameless plug regarding the links on the sidebar which now include stills and a trailer!) would be making games like Sherlock Holmes vs. Jack the Ripper (due out 4/20/10 for XBox 360!) confirms that. But what I've been thinking about, as I get into the depths of Midnight Mystery March here at FMWL, is how Jacky Boy's legacy shaped the horror films we see today. Let's have a look, thanks to my latest Midnight Top Five. 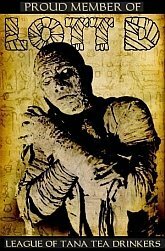 Fear of the Night - Horror movies, and most horror tales, for that matter, have always been about fear of the evils that come out when the sun goes down. But the case of Jack the Ripper was one of the first high profile events to urge real people not to go outside after dark, to the point of parents using The Ripper as a scare story to keep their children from staying out. If Deputy Dwight/Dewey Riley had been in the Ripper's London, he might have said it resembled The Town That Dreaded Sundown. For my purpose, I choose to refer to the Linda Blair/not-The-Exorcist horror Hell Night and its tagline - PRAY FOR DAY. The Smart/Scholarly Slasher - The general idea is that The Ripper, due to his precision and apparent knowledge of human anatomy, was a doctor or at least a well-educated man. This is a phenomenon that has grown in horror over the last few decades, particularly through characters like Hannibal Lecter. 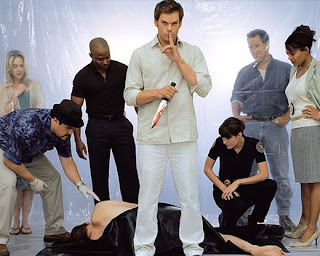 Other slashers have used med students as killers, and we've also seen characters like TV's Dexter take this to a new level. The Friendly/Seductive Killer - The same line of thinking regarding Jack the Ripper that led to him being thought to be a scholar applies in regard to his ability to appear a seemingly normal, and even attractive person to his victims. This tool was widely used in slasher films of the '80s, particularly in the overuse of the "Oh, it's you. What are you doing here?" moment before death. Some believe Jack was also a fairly seductive man (despite the fact his victims were prostitutes - not exactly the hardest crowd to win over, if ya know what I mean! ), and there have been several who've combined the mythology of the Ripper with fictional icons like Lugosi's Dracula who could convince their victims to fall into a trap with a romantic gesture. Women of Ill-Repute are SOOOOOO Dead - I didn't want to google "prostitutes", so I found an image that refers to the next best thing - sorority girls! (I kid! Greek ladies, you know I love you!) Moving on, one of the most well-known trend in horror is that women are the victims, and it's safe to say that The Ripper was the most famous killer of women known. And how does a woman survive a horror film? By not engaging in whore-like behaviors! This one's too easy, lets move on. Killer and Detective as Celebrity - I tried to find a nice quad poster of Seven to go with this point, but ended up settling for any Generic Morgan Freeman Cop Thriller. As The Ripper tale became a matter of national attention, the public became more and more interested in both the details of the killing and the methods being used to track Jack. The Ripper case is noted as one of the first to use profiling to try to enter the mind of the killer, and Detective Abberline is still a notable name even though he didn't catch Jack - even appearing as a character in last month's The Wolfman remake! That's a quick look in to how the Jack the Ripper legend has influenced the horror genre. I'm sure I could dig even deeper into the connection, but I'll let you all ponder from this point forward, and leave your thoughts in the comments below. Don't forget to check out Sherlock Holmes vs. Jack the Ripper in the sidebar, and thanks for joining us as we move forward through Midnight Mystery March! 2006, Dir. by Jonathan Levine. through another cancelled release in July of 2009. Now, as that festival closes up three whole years later, Mandy Lane still waits for distribution in its home country. Thankfully, the world of region free blu-rays has been kind to the film, and I managed to get ahold of a copy of the film, which I've anticipated since reading about it years ago and seeing star Amber Heard start to appear in mainstream films, particularly the mindless fighting flick Never Back Down and her brief appearance in last year's hit Zombieland. Just in case you couldn't guess from the title, All the Boys Love Mandy Lane tells the tale of Mandy Lane - an innocent, athletic, big-breasted, teenage blonde who is adored and envied by everyone, and has been "since the dawn of junior year". The boys want to be with her, and the girls want to be her. Unfortunately, she only has one friend: an outcast named Emmet who's one of those "weakling you can trust won't make a move" types. But after an accident that conveniently opens the film and builds the two characters' personas, it seems Mandy has moved on to trying to fit in with the upper-class of the high-school pecking order, and accepts an invitation to join five peers on a trip to a secluded ranch for the weekend. Anyone who's watched a horror movie knows where this will lead, but Mandy's too pure to have our wisdom. The party starts with a bang. We're talking drinking and drugging, guns, swimming, snakes, and all sorts of sexual "jobs". But as night falls, the same thing that always happens on these secluded teen parties happens - someone starts killing folks. Nothing in All the Boys Love Mandy Lane seems out of the ordinary to this point, from a horror standpoint. But what we begin to see as the film goes on is a distinct focus on building the character of Mandy Lane, and the character begins to entice us the same way she affects the people she's with in film. It becomes clear that there's a subdued "girl power" theme in the film early on, and Mandy Lane is drawn up as more of an ideal than a character for the viewer. Maybe it's just that the hyperbole of the other characters is contagious, or the way Heard carries herself with confidence and a disdain for immaturity, but Mandy Lane becomes the character the title suggests she should be. As the film reaches the final act there are several revelations that shift the plot, and while I love the ideas put forth I did feel that some of the character development was left unexplained. It was easy for me to assume what the intentions were from my own standpoint, but the film never clearly states where it's gone as it rolls to a conclusion. Again, I like what happens as the plot wraps up, but I think it leaves a lot to interpretation that, if stated, could have made the film more powerful. I don't think Mandy Lane is a reinvention of the slasher genre that is destined to be a horror classic (with a little tweaking, it could have been), but it's an original and fresh stab at the genre that's more than welcome. Thanks to Heard's lead performance and the intriguing presentation of the survivor girl story I'm more than happy to recommend All the Boys Love Mandy Lane, and I hope that, despite release and distribution issues, it someday gets the attention it deserves. Produced and directed (and edited, too, but who's counting?) 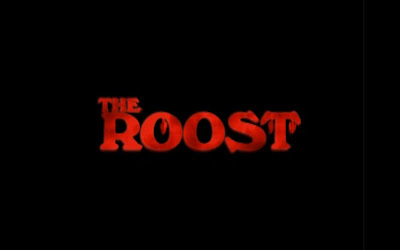 by Ti West, The Roost premiered as an episode of Frightmare Theatre, a late night horror show akin to the haunts of Elvira or Fright Night's Peter Vincent. 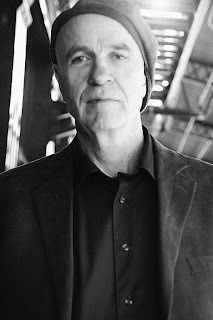 Frightmare Theatre was hosted by a pale, tall, Lurchy fellow who looks kind of like actor Tom Noonan, and was the Saturday night attraction on a Channel 13 somewhere. Or at least that's what West's film asks us to believe as it opens. West, now popular after his successful The House of the Devil (one of The Mike's favorite films of 2009), in fact made The Roost in 2004 as his first feature film, and it stands up 6 years later as both a triumphant throwback to midnight horror shows of the past and as a technically impressive chiller. 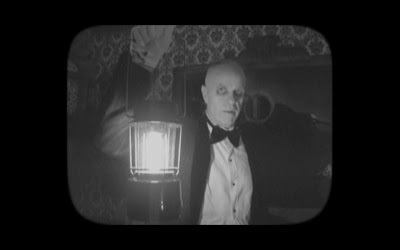 After a brief introduction from one Noonan's character, who is hosting Frightmare Theatre from a black-and-white hilltop haunt while "The Master" is "away on business, we meet four friends on a dark road traveling to a wedding the next day. As if the setting being dark and deserted isn't enough, we quickly are informed that it's both near midnight and Halloween night. Clearly, the stars are not aligned well for West's characters, as their car is attacked from above and ends up stuck on a roadside obstacle. From there, it's off to a nearby farmhouse to look for help, but a cut away shows us that nearby place is just as deadly as the roadside where the young people are stranded. The set-up should sound familiar to horror fans, but that's not a problem here. West's grainy camera embraces the cliches of horrors gone by lovingly, and the film gives the plot power through lingering exposition shots, moody lighting, and a screeching musical score. This isn't one of those horrors where the tension comes from waiting for someone to sneak up on someone else, at least most of the time. Like House of the Devil, or West's inbetween film Trigger Man, there are plenty of moments of pure shock in The Roost. I don't want to spoil too much of the plot, but you should know that the film will probably remind of anything from The Birds or Bats to Night of the Living Dead or The Evil Dead, or maybe all of the above. And yes, it hurt to list Bats with those other three films, and I apologize to the souls of Hitchcock, Romero, and Raimi. Like the three filmmakers listed, West has great patience when creating scares - often holding off just long enough to turn our tension in to relief right before a surprise occurs. The Roost feels like a filmmaker's first film, for sure, with unimpressive acting, some plot holes, and a short run-time that leaves the viewer barely sated. But from a minimalist approach, the film succeeds in looking and sounding great (that musical score is really fantastic) while presenting a genre tale in an effective and inoffensive manner. While I don't recommend The Roost as a classic of the genre or even an altogether impressive horror film, it's a fantastic showcase of what this young director can offer the genre in the future. For simple late night chills, The Roost is a more than adequate choice for Midnight Movie of the Week. Here's to many more from Ti West, and to hoping he's learned from the experience on Cabin Fever 2. Stay hungry, young filmmaker! 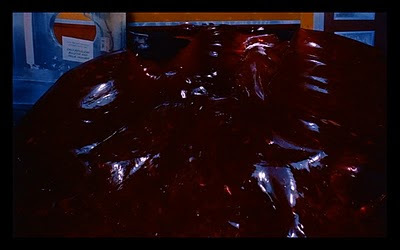 THE BLOB WAS ON THE OSCARS!!!!!!!! I'm a Mr. Horror Blogospherer!